I love all things Snickerdoodle (which by the way, spell check doesn't think is a word...). Have you checked out my Snickerdoodle Candy Cups? Problem is, with Snickerdoodles, I usually like the Krusteaz box cookie mix better than I like them homemade. I like the box mix so much that I am actually scared to make them from scratch because I feel like nothing will live up to the image I have built up in my head. So when Justin said he was craving something "snickerdoodly" (also not a word), I scoured Pinterest for recipes. You would not believe all the different types of Snickerdoodle themed desserts floating around out there other than your basic cookie. I found Snickerdoodle cupcakes, Snickerdoodle fudge, Snickerdoodle pie, Snickerdoodle cake, Snickerdoodle ice cream, and even Snickerdoodle pancakes. But when it came down to it, I was looking for something quick, easy and that didn't require a trip to the store. 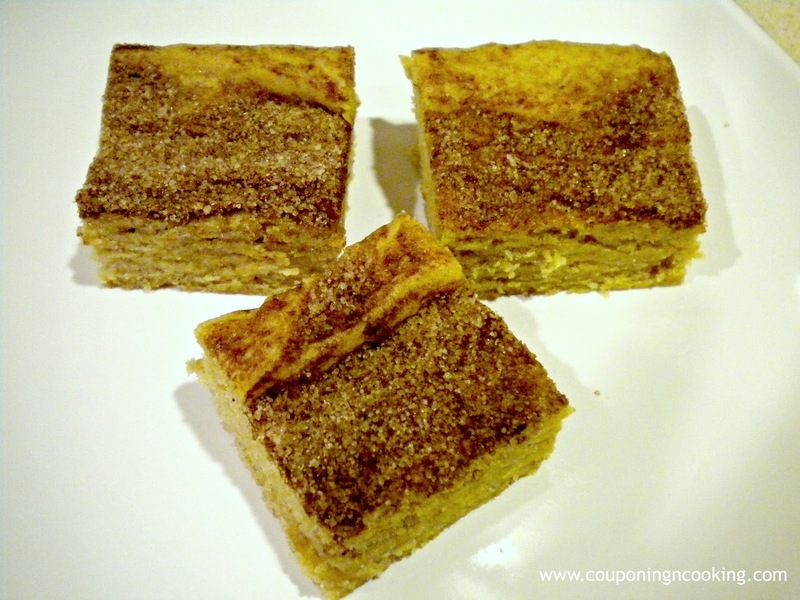 So I settled on these decadent looking Snickerdoodle Blondie Bars from the Brown Eyed Baker. And I am so glad I did. These bars are like nothing I have ever made before. They are sweet but not overwhelmingly so. They are moist but still retain their shape. 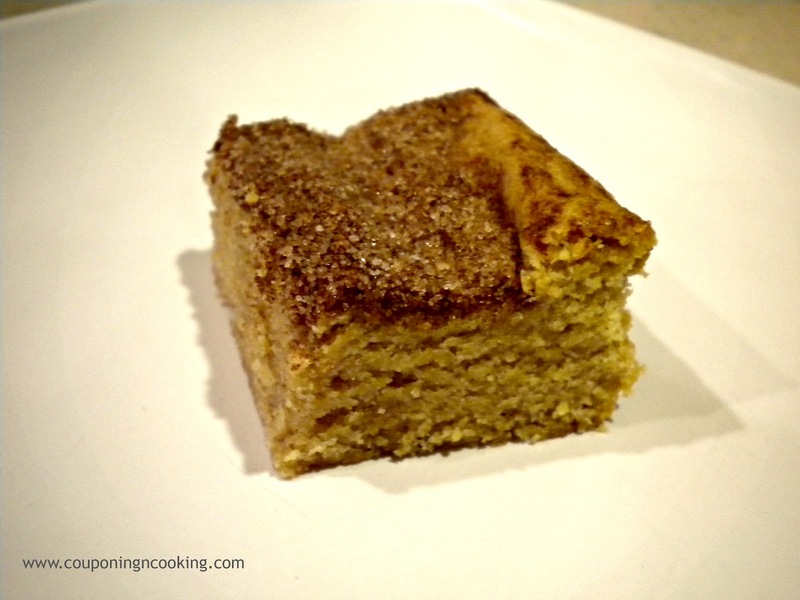 It's sort of like a coffee cake and a Snickerdoodle cookie had a baby if you can imagine that. I don't usually like blondie type bars. I always end up disappointed in something that is shaped like a brownie but lacking in chocolate. But one bite of these Snickerdoodle Blondies and I was a convert. 1.) Beat the butter and brown sugar together until light and fluffy. 2.) Beat in the eggs one at a time followed by the vanilla. 3.) Combine the dry ingredients (not including those for the topping) and slowly stir them into the wet ingredients. 4.) Lightly spray (I also used foil) a 9x13 pan and spread the batter out evenly in the pan. 5.) Mix together the white sugar and cinnamon for the topping and sprinkle the mixture over the batter. 6.) Bake at 350 degrees for 20-25 minutes or until the top feels firm and springy to the touch. Let cool for at least 30 minutes before trying to cut them. all I can think is "oh my heck." This is the best thing I ever came across! Found this through Alexis's What I Learned Wednesday Link Party. These look GREAT! I have recently become addicted to snickerdoodle cookies and this looks like a great variation! And as we hardly have here cake-mix I always make everything from scratch. 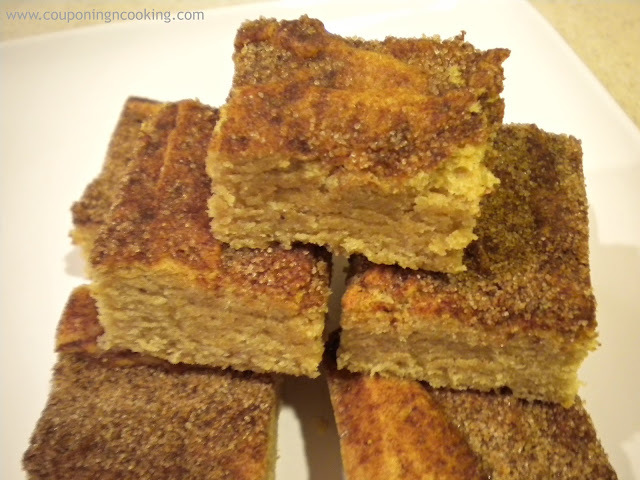 We love Snickerdoodles and these Blondies would just be awesome, we will love them. Hope you are having a great week and thank you so much for sharing with Full Plate Thursday. OMG - yum! I want to make these for breakfast!! Is that even legal? Thanks for sharing at the Pomp Party! Pinning! These look delicious! Coming over from the Pomp Party. New follower! Looks yummy! 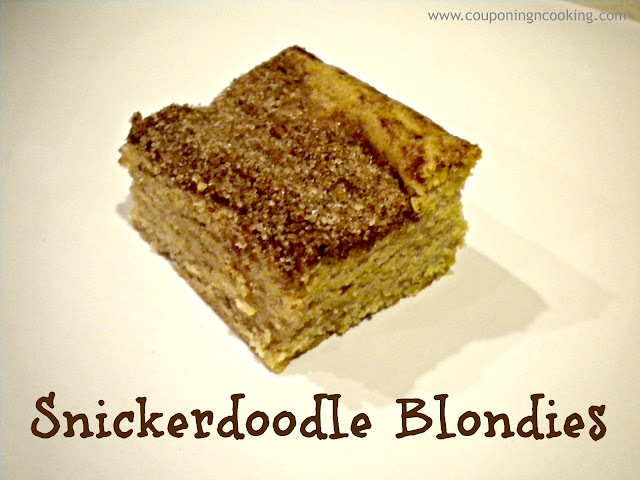 I love snickerdoodles, and I love blondies, so what's not to love? These look so yummy! Combining two delicious treats is definitely a win with dessert. Thanks for sharing this recipe on our link party. I know my readers will love to see it. I love Snickerdoodles and when desserts start having babies, well, I'm hoping for triplets! Can't wait to give these a try! 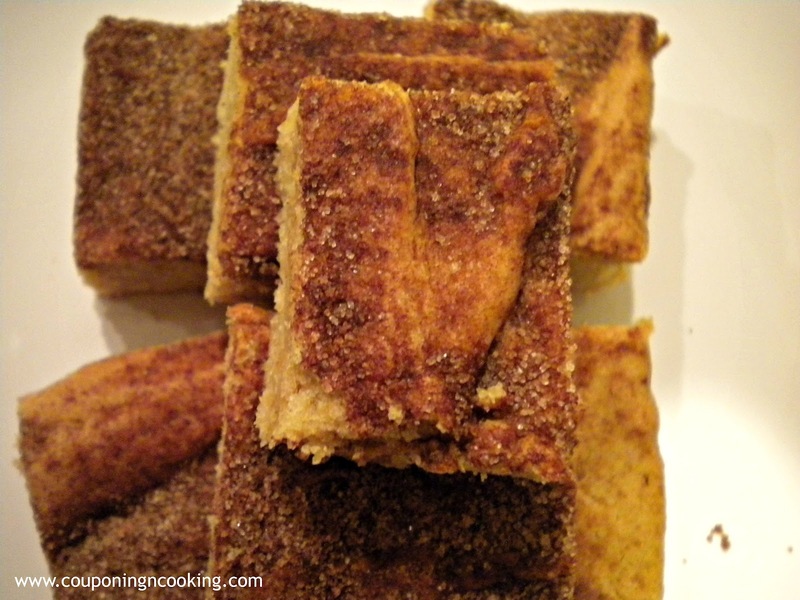 I don't know if I've ever had a Snickerdoodles, or Blondies, but they sure sound good and make a great combination. I can almost smell them, and wanting a piece really bad right about now! Thanks for sharing your creative inspiration with Sunday’s Best – you helped make the party a success! maybe I'll have to make some for my fam. tonight! They would LOVE that!!!! Love blondies...love Snickerdoodles...whoever thought of combining them is a genius. Thank you for this! Glad I found your site on the Eye Heart linkup! Oh dear did my eyes light up when I saw your link at Mop it Up Mondays. (I am super pregnant btw!) Snickerdoodles?! Blondies?! too of my favorite things paired up! thanks so much for posting and giving me quite the relentless pregnancy craving! I foresee these in my belly soon. Those look fluffy and fantastic! Thanks for sharing! Snickerdoodles are my favorite cookie - I bet they would be great as a blondie! Pinned to try :) Just wanted to thank you for linking up last week and let you know the party is live now! I can't wait to see what you share this week at All my Bloggy Friends!